There is a sense of stability fairly stable, also made easy installation. This review is about item#35457965. The product is as perfect as Nishimoto feeling, but it is expensive for cheap moping. (Stars 1). Why is it so expensive compared to other models for Zoomer, especially it seems not to be made complicated, special. Since it is for sale (service), I was at a loss as to whether to make imported goods of a certain shop cheaper by 30% or more at first, but I decided on a company effort of monotaro. Although it is made in Japan, repeat is impossible in high. Next time we will reconsider including imports. It is a popular strengthening stand, but I think that it is the cheapest to buy here. There was no problem in the packing of goods, shipping. When attaching to the car body, it is necessary to consider the tightening with the pivot bolt (enclosed with the stand) so that the collar moves freely (because the stand and the swing arm tighten together). I coped with the filing of the hole to which the collar is attached and the washer on the pivot bolt and coped with it. Super cub genuine stand was a sense of stability I wish I had installed it earlier. It is attached to turnip 90. Because the genuine side stand is somewhat less stable, I installed this product. I understood the reason why turnip users gained tremendous support. The sense of security is different. Installation is also easy. As for the standard specification, the rigidity of the step bar to which the stand is connected is weak and to prevent accidents due to forgetting to store It was made easy to be disengaged intentionally, and it was nervous at the time of parking every time the road surface tilt and steering wheel angle More rigidity Swing arm Pivot mounted between cross members Thanks to this product leaps and bounds It became stable. The attached manual was carefully written and an easy-to-understand figure was posted and my model was right. 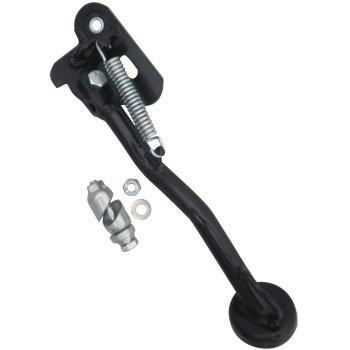 Stand up the center stand and remove the bolt of the swing arm and place the opposite muffler stay From the side It is easy to return the position of the hole of the swing arm which is easily displaced if you stick a bolt about 5 to 6 cm long close to the same diameter Work is quick. Normal, unstable side stand. If it is exchanged for this, it will be more stable than the center stand. I think that this is genuine and good. However, there was a missing item of a washer. Although it was also in the previous review, the inspection is complicated. Well, I did not get in trouble because the correspondence was made with the washer on hand. Since things are good, I'd like to ask manufacturers not to stick with strange places.